In the front of the foot, the joint at the base of the great toe is the most complex. Here the bones, tendons and ligaments work together to transmit and distribute the body's weight, especially during movement. Should this joint become abnormally stressed over an extended period of time, a bunion deformity may result. A bunion (from the Latin "bunio," meaning enlargement) is a protuberance of bone or tissue around the joint. The enlargement occurs either at the base of the great toe or on the outside of the foot, at the base of the little toe where it is called a "bunionette" or "tailor's bunion." Bunions at the base of the great toe usually begin when the big toe starts moving toward the smaller toes when tight, pointed shoes are worn. This crowding puts pressure on the joint, pushing it outward. The movement of the joint in this outward direction starts the formation of a bunion. A common deformity of the big toe joint, a bunion occurs mostly among people who wear shoes. Women are more frequently affected with bunions because of tight, pointed, confining or high-heeled shoes. Wearing high heels is especially stressful on the joints of the foot because all of the body's weight rests there. The foot is then forced into a narrow, pointed "toe box", compounding the problem. Older people are also vulnerable to bunions because of the higher incidence of arthritis affecting the big toe joint. A bunion is most often a symptom of faulty mechanics of the foot. The deformity runs in families, but it is the foot type that is hereditary, not the bunion. People with flat feet or low arches are more prone to develop the problem than those with higher arches. Bunions also may be associated with various forms of arthritis. Arthritis can cause the joint's protective covering of cartilage to deteriorate, leaving the joint damaged and with a decreased range of motion. Parents who have bunions should know that there is a strong hereditary predisposition to bunion development, and should have children evaluated if early signs of deformity and/or discomfort are evident. If the child has the same foot type, there is a possibility that a bunion will eventually develop. The main goal of early treatment is to relieve pressure on the bunion and smaller toes, and to diminish the progression of joint deformities. Padding the bunion is an important first step, as is wearing shoes that are large enough to comfortably accommodate the bunion (such as sandals, athletic shoes or shoes made from soft leather). Stiff leather shoes may be stretched slightly for greater comfort. Tight, confining or high-heeled shoes should be avoided. Medications, such as nonsteroidal anti-inflammatory drugs or cortisone injections, may be prescribed to ease pain and inflammation caused by joint deformities. Physical therapy, ultrasound treatment, whirlpool baths or other techniques can also provide temporary relief. Orthoses (shoe inserts) may be useful in controlling abnormal foot movement, and may reduce symptoms for those with a painful bunion that has not yet caused a significant bony abnormality at the joint. If a systemic disease like rheumatoid arthritis or gouty arthritis is related to the bunion, appropriate medical treatment may be recommended. When conservative treatment does not provide satisfactory relief from symptoms, or when the condition interferes with your activities, surgery may be necessary. Pain and deformity are significantly reduced in the great majority of patients who undergo bunion surgery. In addition to easing pain, the purpose of bunion surgery is to remove the enlargement and realign the joint to restore normal function. This means that after surgery, the foot can carry the body's weight properly, and that special shoes are no longer needed. Postoperative orthoses or supportive devices may be recommended to improve foot function. Surgery may be performed at a hospital, surgical center or properly equipped office operating room. Depending on the procedure, the facility at which it is performed and the patient's medical status, the surgeon may choose a local, spinal or general anesthetic. In many cases, the procedure can be performed under local anesthesia. Many surgical procedures are used to correct bunions. The decision to employ a prodedure is based on the severity of the deformity, the patient's age, the general health of the patient, their activity level, and the general health of the bones and connective tissue. Other factors may influence the choice of a procedure used. For a mild bunion, the podiatric surgeon may remove the enlarged portion of bone and realign the muscles, tendons and ligaments surrounding the joint. For a moderate bunion, the podiatric surgeon may cut the bone and shift it to its proper position. Whether or not the bone is cut depends on the severity and location of the deformity. In addition, the surrounding tendons and ligaments may need to be repositioned. For a severe bunion, a combination of the following procedures may be necessary: removal of the enlarged portion of the bone; cutting and realignment of the bone; and correction of the tendons and ligaments.If the joint is destroyed beyond repair (commonly seen in arthritis), it may need to be reconstructed or replaced with an artificial joint. Joint replacement implants may be used in the reconstruction of the big toe joint. 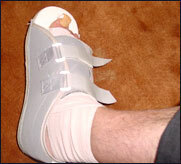 Following surgery to correct a mild or moderate bunion, the foot is bandaged and a postoperative shoe is usually worn for three to four weeks. The amount of activity allowed will vary, and the podiatric surgeon may suggest that flexible footwear be worn for several weeks either directly after surgery or after wearing a postoperative shoe. If the bone was cut, as in surgery for a moderate to severe bunion, it may be held in place with an internal pin, screw or absorbable rod. In many cases, a slipper or short leg cast is worn for four to six weeks, and walking is assisted by crutches. Movement of the toe joint is important after any type of bunion surgery. Specific instructions for exercising the joint will be provided by the podiatric surgeon. After the foot has healed, and if the bunion was the result of improper foot function or foot type, the cause of the problem should be addressed. 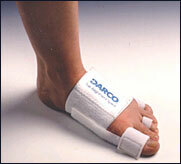 Orthoses may be prescribed to protect the foot and improve its function. Guidelines may also be provided by the podiatric surgeon on the types of shoes that should be worn. These instructions should be followed carefully to avoid recurrence of the bunion. After surgery, the foot may become narrower. Also, for a period of time, the joint may remain slightly stiff and not be as flexible as before the surgery. Gradual return to normal activity will be recommended by the podiatric surgeon as healing progresses. Some risks when considering bunion surgery include joint stiffness, malalignment, joint pain and recurrence. The ultimate goal is to relieve pain and prevent the bunion from recurring.